SSC Serv is a service for Microsoft Windows, which collects system statistics and submits them to a central statistics server. It is similar to and compatible with collectd, a free and open-sourced solution for UNIX systems. The purpose of SSC Serv is to collect performance data on Windows servers. This data is then sent over the network to a server which stores the data for later processing or visualization. The service is very lightweight and can collect high-resolution statistics without affecting system performance in any noticable way. SSC Serv is developed using the core Windows API. 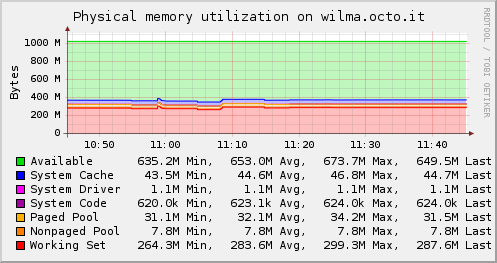 This allows for a very small memory footprint and avoids additional dependencies. SSC Serv is fully integrated in the system: The service can be controlled using the Services Control Manager. Configuration can be done using the "SSC Service" applet in the Control Panel. The configuration is stored in the Registry, so you can use existing tools for configuration management. And, in the best of UNIX traditions, the daemon can be uninstalled without any leftover files or dead registry keys clogging the system. Efficiency is one of the top-most priorities of developing SSC Serv. It is designed to be lightweight and unobtrusive. After the initial set-up, it will get out of your way so you can go on and focus on more important issues. But when there are issues, the high-resolution metrics will certainly come in handy and help you identify the problem quickly. Uses the “binary network protocol” to send metrics to a collectd server. Sends metrics to Graphite, an open-source time series store and graphing system. Integration with Librato, a hosted graphing and alerting solution. Send JSON-encoded metrics to arbitrary web services using POST requests. The Network plug-in can send data to a collectd 5 server for further processing and storage. The data is structured and encoded for maximum compatibility with collectd version 5.0 and later. With the Graphite plug-in you can send metrics directly from your Windows server to Graphite, a popular open-source graphing solution. Using the Librato plug-in you can send your metrics to Librato, a hosted metric storage, visualization and alerting solution. Take advantage of the features Librato offers without having to run your own metrics server. SSC Serv is available as x86 (32-bit) and x86_64 (64-bit) binary. Running the x86 binary on a 64-bit version of Windows unfortunately doesn't work. Other than a compatible version of Microsoft Windows, there are no further dependencies – the service can simply be installed by downloading and executing the setup utility.